Manchester Walking Football December 2017 was the fourth and final session of the Greater Manchester Walking Football Over 60’s Autumn League. On a sunny but cold day we were honoured by the presence of ARD German Television, who were filming a news clip ‘The Growing Popularity Of Walking Football’. With the league growing from nine teams in the first session in February this year, to fifteen teams at the final December session they certainly picked the right location. With new ‘lads’ Third Space Seniors WFC joining us in Division 3, this filled our capacity for fixtures on a single day at the Heywood Sports Village. With other teams showing interest, our only option now is to start another monthly session on a different date in each month. 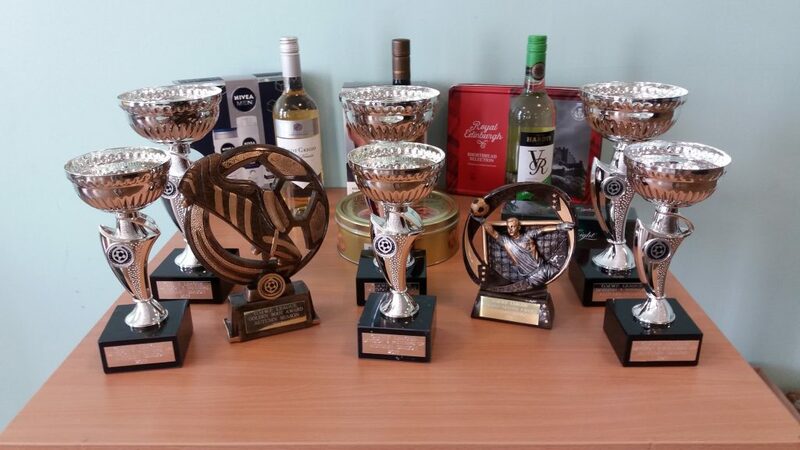 With this being the final session of the Manchester Walking Football December 2017 league, it was all to play for with trophies for each divisional winners and runners up, as well as the Golden Boot and Golden Gloves awards. In Division 1 leaders Rochdale AFC Strollers drew 0-0 with second placed Nash Amblers to maintain their four point lead. Rochdale Striders had a good day picking up five points to add to their previous total of six points. If only they had played as well in previous sessions they may have avoided relegation to Division 2. They are going to be a force in the lower division, that’s for sure. In the event Rochdale AFC Strollers won the league by a six point margin over runners up Nash Amblers. Chadderton FC WF finished a point behind the Amblers and for me were one of the best teams in the division, always showing great passing and movement and being sound defensively. Vintage Celtic, the Spring league winners, fielded a makeshift team due to suspensions and holidays, and it certainly showed with four defeats, but at least they fulfilled their fixtures without disrupting the league format. Division 2 ended up ‘as you were’ with the top three teams all gaining six points. Fleetwood Town Flyers finished runners up on twenty five points and league winners AFC Blackpool Senior Seasiders finished on twenty eight points. Bolton Wanderers A came third, a point behind the Fleetwood side. So the Seasiders find themselves back in Division 1 for the Spring league in 2018. They certainly won’t out of place and that division looks to be a highly competitive affair next year. New boys in September, Roach Dynamos, fared reasonably well in their introduction to league walking football and provided the joint top scorer in this Autumn league session. Maccabi Old Codgers, who lately have looked a much improved team, added three points to their similar total, up to and including last month, and unfortunately find themselves relegated to Division 3 next February. Almost always having to borrow players, they have to be applauded for sticking with it and let’s hope their fortunes change in the Spring. The conclusion of Division 3 in this Manchester Walking Football December 2017 was a nail biting affair, going into the final game before placings were decided. With one point separating the top three teams, it was all to play for. Wakefield Wanderers came from behind in third place, with seven points in this Manchester Walking Football December 2017 session, to top the table on nineteen points and find themselves in Division 2 for the Spring league. Leaders in November and other new boys in September, Bury Relics gained five points and finished runners up with eighteen points. The Relics beat third placed Nash Bees, who also had eighteen points, to the runners up spot on a goal difference of four. Joining us for the final session of the Autumn league, Third Space Seniors WFC, had a creditable five points, with a win, two draws and a single goal defeat to Bolton Wanderers B, who in turn had a win, a draw and two defeats. The Seniors certainly won’t be out of place in this league come February. All the results and tables can be seen HERE and HERE. This was also filmed by ARD German TV and I am sure we all look forward to seeing the finished article. Almost six hours filming for what will be a four or five minute news item seems a lot of hard work but that’s how the industry works. It’s a pity we cannot get a half hour video of the footage. Pete Smith of Fleetwood Town Flyers won the Golden Gloves Award with only two goals conceded in sixteen games. 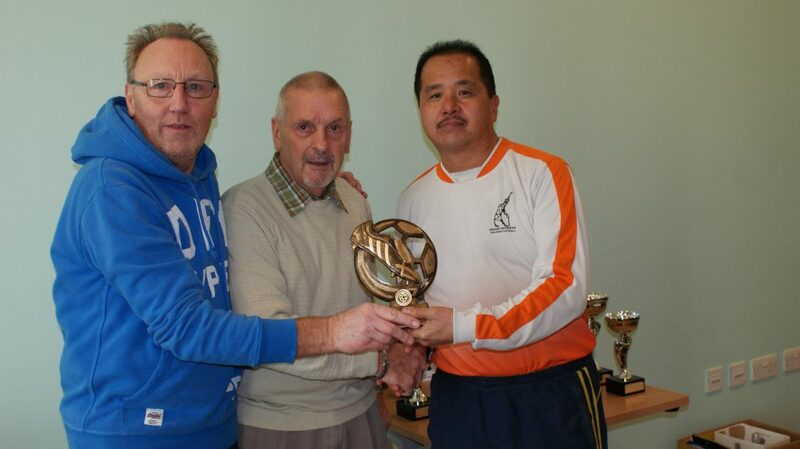 The Golden Boot was shared by AFC Blackpool Senior Seasiders player Wai Hon Tsang and Roach Dynamos player Mick Tarpey with seven goals each. 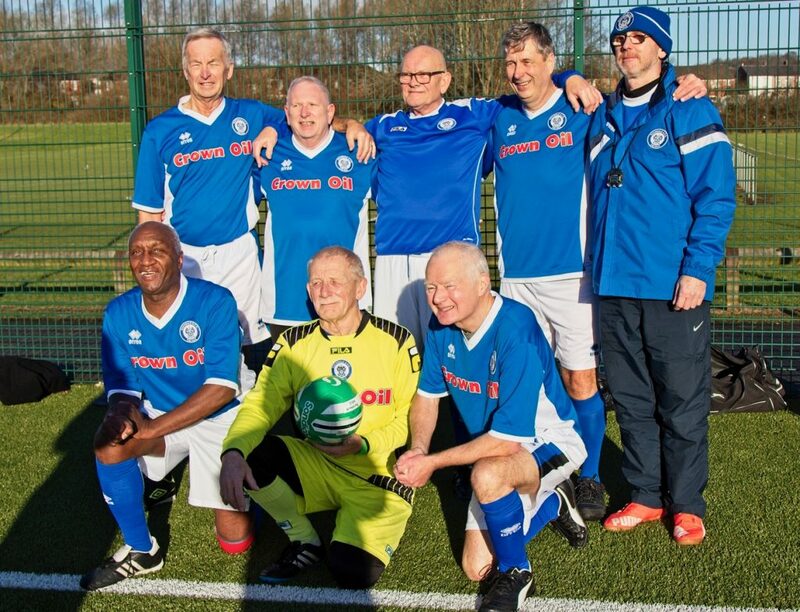 It’s been a great year for Rochdale AFC Strollers, winning the Autumn league and also winning the two Over 65’s Cup Tournaments in June and November. Their player, Steve Colesby, even won the Footgolf tournament in August. The full Gallery of photographs of the day can be found HERE. So it’s big thanks to ARD German TV for their involvement on the day, to Barry Woodburn for his registration duties and some excellent photography, and of course to Paul Gardner who oversees the sessions with his usual efficiency, books the referees, the caterers and the excellent venue. As mentioned in Paul’s speech, the referees we have in this league are some of the best in walking football, so again it’s a big thank you to Alan, Frank, Matt and Mike. The raffle, supported as usual by our generous teams, raised £200 for the Stroke Association, so thanks to you all for your contributions. We hope you are all set to join us again in the Spring League starting in February and also for the Over 65’s League starting later in that month. We are also holding two Over 70’s Cup Tournaments as well as the annual Martin Dawson Memorial Trophy in 2018. Finally, and I make no apology for repeating this every post, you have a facility on this website to advertise your weekly sessions, contact details, showcase a gallery etc. Why not take advantage of this, it’s virtually a free one page website. If you wonder what your own page could look like click HERE. If you would like your details online email me HERE with all the information you would like included. This is YOUR website, so please leave a comment below, on any aspect of the league or it’s sessions. It’s easy to do. You can also raise your own topics by joining the Forum. This comment from Blackpool AFC Senior Seasiders Chairman Les Turner is on the News page Comments but I feel that it’s well worth repeating here. A big THANK YOU to Mick Tarpey of Roach Dynamos for the best example of sportsmanship that I have ever see on a football pitch. Mick won a penalty against us and stepped up to take it. Our keeper saved it but the ref (wrongly) said that the kick had to be retaken because Mick has taken more than one step. Mick stepped up to retake the penalty and tapped it to our keeper saying that it was the wrong decision and if he hadn’t scored with more than one step then he didn’t deserve to score. Mick’s sportsmanship cost his team three points and himself the Golden Boot for being top goalscorer BUT he did the right thing. An example to us all. Just had a repair done to my shoulder, it was a day case, full anaesthetic operation. It’s an injury from last May, caused by a fall during a game. It’s not caused much pain but irritable when waking up for the during the night peeing sessions. I’m in a sling for 4-6 weeks, so no footy until end of January. I played in all the Heywood 60’s and 65’s comp’s for Blackpool. Fantastic Comp’s and brilliant organisation. Looking forward to next years Comp’s, bring it on, especially the new 70’s comp (are Zimmer frames allowed?). Merry Christmas to all my new W/Footy mates, a great bunch of lads, long may they play the game they love. PS anyone out there play for “The Gardeners Arms” mid sixties? Just got to say that taking up walking football has given me a second footballing career when I honestly thought my playing days were over! I loved playing, eventually having to retire at 40, although coaching and managing at junior level kept me in touch. I missed the camaraderie and banter so much – but now thanks to Paul, Steve and all of the guys both at Rochdale AFC and the other clubs, not to mention Bill and the other marvellous officials of the league I can look forward to playing for many years to come. Brilliant. Thank you. I am minded to write to you concerning the conduct of one of the Roach Dynamos players last Friday. The player involved was Mick Tarpey and it revolved around a penalty taken in the game against AFC Blackpool Senior Seasiders. Mick had his penalty saved but the referee ordered a re-take as he had taken more than the one step during the shot. Mick pointed out to the referee that that wasn’t the correct ruling as the penalty was missed, and he then refused to take a second kick. This was a highly commendable action and one which shows off the Walking Football Etiquette at it’s highest level. Not only did this deny Roach a possible game winner but also denied Mick the outright winning of the golden boot award for the tournament. He is to be praised as a true gentleman of the game and reflects their club’s wonderful attititude to the game we play. Steve, I think it’s great that you have taken the time to highlight Mick’s sportsmanship in the leagues finals session of the Autumn league. Full marks as well to Mick for his unselfish actions that epitomises what this league is all about. See ‘Top Man Mick’ in the Forum. It was just the right thing to do, I want to win as much as the next player but the keeper made a great save, end of. So I’d just like to thank you for pointing out the event but I, like all of us, are there to enjoy the day. All the best, Mick Tarpey, Roach Dynamos. Well Done Mick Tarpey. Top man! Another excellent series of Walking Football competitions. The standard continues to improve and the smooth running of the days is a credit to Bill, Paul and Barry. We are looking forward to the extension to the competitions next year to include Over 65 and Over 70 levels. More football for more players. Who will be the first to turn out a 75+ team ? We are getting there. Monday sessions have been cancelled due to Christmas and New Year’s Days!! Where is the commitment? Again many thanks for allowing the Wakefield Wanderers to participate in the GMWF League – it is the best organised league we have seen with referees who have an understanding and awareness of the rules and use them effectively. All the teams in Division 3 are to be commended and we certainly had to win it the hard way – think any of them would not be out of place in Division 2. 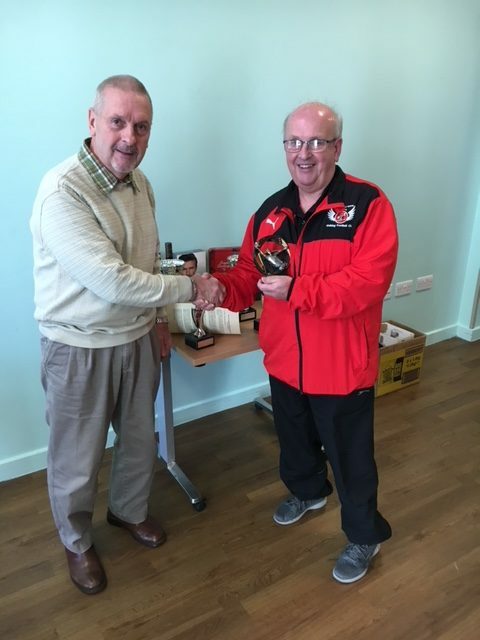 We really appreciate the work that Bill, Paul and Barry do in the background to improve and extend the reach of Walking Football to the increasing number of participants. Niall ODonnell, Chairman Wakefield Walking Football.